I've come to rely more and more on the "Fix Pacifica" blog to keep current on scheduled events and meetings related to the Sharp Park controversy. More free wheeling and fun than Pacifica Riptide, it also has a much more open commenting and submission policy. In fact, it exists because many Pacificans could not get their voices heard at Riptide. That's what happens in the Internet Age. As the saying goes - "Information wants to be free". 1. Wednesday, December 16, SF BOS Audit and Gov't Oversight Sub-Committee Public Hearing, 1PM, Room 263, Second Floor, SF City Hall This will be the last Public Hearing and opportunity for public to voice their concerns and desires before the SF BOS makes their future ultimate vote about the fate of the Sharp Park Golf Course. Upon hearing the public's comments at Wednesday's meeting, the SF BOS Sub-Committee will make a recommendation to the full SF BOS, who will, at a later date, cast the ultimate vote, after learning both the recommendations of the SF BOS sub-committee from this day's meeting and the voting results of the Rec and Park Bd of Commissioners, from the next day's meeting on December 17th). This will also be the last Public Hearing of the SF Rec and Park Board of Commissioners on the fate of the Sharp Park Golf Course. They will be immediately voting after listening to the public that afternoon and that vote/recommendation will then go to SF BOS for their ultimate vote on Sharp Park Golf Course fate. As those of you familiar with the posting of the Agenda for public meetings know, it is the rule that the Agenda has to be published 72 hours before a meeting...now that doesn't always happen, but it did this afternoon and it looks like there have been some refinements and clarifications made to the public meeting on Thursday, December 17, 2009 of the SF Rec and Park Board of Commissioners concerning the Sharp Park Issues. Discussion and possible action to adopt the General Manager’s recommendation to proceed with the recovery plan for the San Francisco Garter Snake and California Red Legged-Frog and to preserve an 18-hole golf course at Sharp Park. This item is continued from the November 19, 2009 Recreation and Park Commission meeting. Public comment was received and closed. Follow the subject links to Barb's post for more color on these meetings. Apparently public comment is now closed in the Rec and Park Commission meeting. Glad I got my two cents in at the last one. I'll have more to say about that sea wall though. Stay tuned. This level of voluntary habitat restoration cannot fairly be characterized as an “all-golf solution,” as golf’s opponents would have it. Nor can the Department’s methodology or its six-month, 400-plus-page study be accurately characterized as a “rush to judgment,” as golf’s opponents say. This is the Department’s third golf study since February, 2007; all of them have recommended continued operation of the Sharp Park course. Sharp Park is a Rarity: a Well-Loved, Modestly-priced, Classic Golf Course. 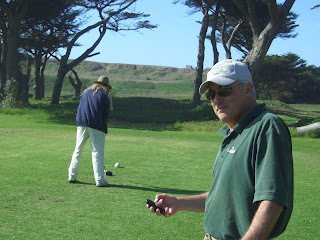 Congressional, San Mateo County, and City of Pacifica Leaders Support the Golf Course. Sharp Park is a legacy of the Great Golf Architect Dr. Alister MacKenzie. The Plight of the Course Has Attention from the World Golf Community. Hole 12 and Course Realignment Proposals Should Be Subject to a Golf Design Competition. The Sharp Park Report Seeks to Balance The City’s Discretionary Effort to Create New Habitat, with the Preservation of the 77-year old Historic Golf Course. There is Broad Public Support For a “Win/Win” Option to Save the Golf Course, While Benefitting Natural Habitat. Follow the link for the full argument. See you at City Hall on Wednesday and/or Thursday.